My Mum had an accident last December and had problems sleeping. My sister in law gave her a This Works gift set and in it was this sleep spray. Mum loved it and asked me to get her some more so when I was getting her one I decided to get one for myself as I was having problems winding down at night too. I do realise being a mother I stress and worry about my child, school, friends, schedules and basically it sometimes keeps me awake for hours. I’ve tried lots of different methods before to relax and unwind before bed but nothing really worked. 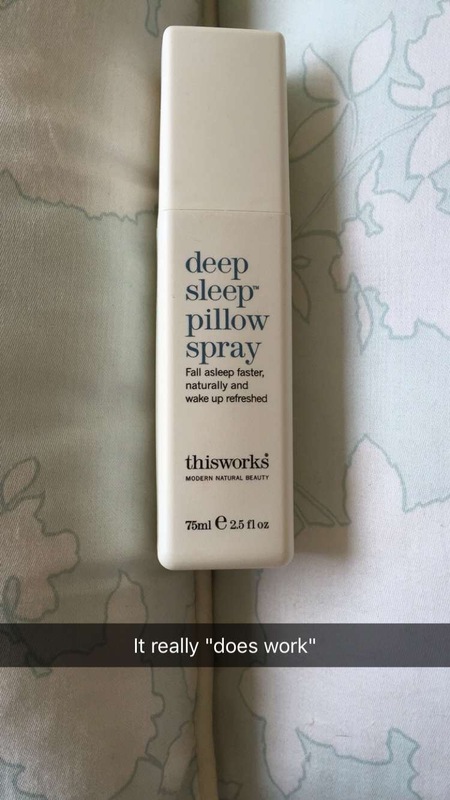 Anyway I gave the Deep Sleep Pillow spray a go and I have not slept better! The scent makes me feel relaxed and calm. It definitely does work and I’m nearly finished the bottle after 3 months, I’m not sure how long you should get out of it but I was spritzing my pillows and duvet before I brushed my teeth so when I slipped into bed the aroma was in my whole bedroom. I do like lavender scent, I used to think it was a “Granny Smell” but now I associate it with my bedroom and sleep. I would recommend this sleep spray to anyone having problems sleeping and do so regularly. I think I’ve told everyone possible about it.